P.S. Notes is made to work alongside the various plain-text, Dropbox syncing mobile notes apps such as Denote for Android and Jottings for iPhone from an app for the Ubuntu desktop. Plain text notes anywhere you want. Easily synced between your desktop and phone. Notes, plain and simple. Download the latest installer with support for subfolders in notebooks and new markdown editing shortcuts! But the installer doesn’t include a launcher or icon, so you’ll need those as well. Like it? Please say thanks. Will any of these features be included in the future? Good suggestions though – eventually I may work on adding a way to sort the notes like that. I second the need for sort by most recently modified. My list is growing, and I want to keep my notes, but I’d like the one’s I’m currently using to be on top. Thanks for your consideration! I know it’s been a long time, but I finally made some time to update my apps and I figured out how to add this in! There’s now an option to sort by most recently modified. 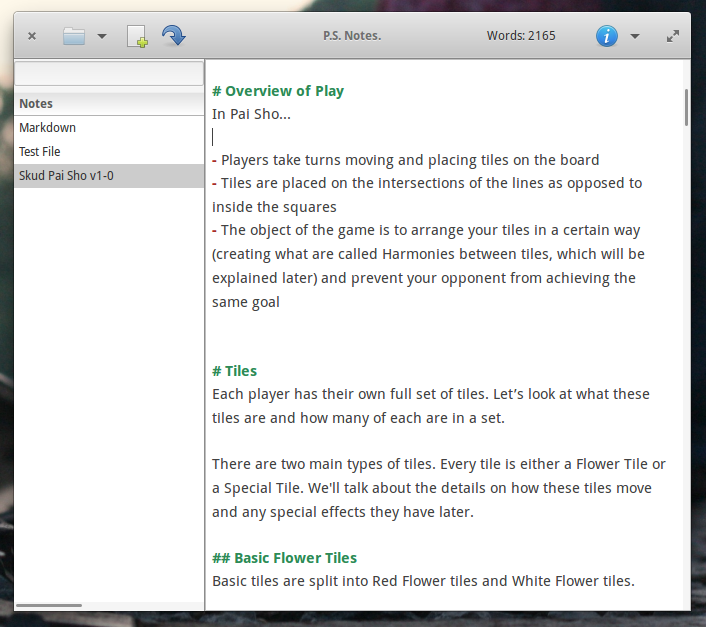 I have purchased ps notes from ubuntu software store on my desktop. I have got software centre synced between my desktop and laptop. Do I have to pay again to use ps notes on my laptop? Hi JP – I also sent you an email reply about this. But, if you sign in to the software center after choosing “Reinstall previous purchases” from the File menu you should be able to install it on as many computers as you want. Let me know if it does not work for you. Thanks! It is nice and useful but lacks basic features that automatically save and can be minimized in the taskbar, I like tomboy alternative. I have long sought a replacement for slow, crufty tomboy. This is it. Did you use vala or genie to code this app? I can’t find much info on genie. I want to code my own tomboy replacement with automatic wiki links, but I am waiting for a genie manual. In the meantime yours is almost perfect, and it is fast. Wiki links without slowing it down like tomboy would be soooo useful. But if such a feature makes the app slow or freezy, it’s better to do without. It’s written in Vala, yes, but I use the Anjuta IDE. I don’t often work on these applications, but next time I do I will try to look into adding [[Wiki style links]] in. Thanks! GPLv3 and payware? Please explain how does this combines? Thanks! It’s open source, and I have it set up so everything can be downloaded and installed from the ppa. From the Ubuntu Software Center, it is available for purchase. Hey, thanks for response! That’s interesting strategy, I have been thinking for this conflict over and over. For example, fairware – but author gave it up, yet understood he set it as shareware and gave little chance. Interesting approach, looks quite elegant and efficient. Very nice! Nice little piece of work. I used to keep a selection of text files on my desktop, sync’d through the cloud with SpiderOak. Now i’ve dumped them into one folder and access them all at once. I would appreciate a text search that looks through all notes (or even just the active note). When they get full, it’s a lot of text to muck through to find something specific. Hi Greg, yeah text search is something I want, too. I think I’ll go ahead and put that on the top of the to-do list for now! It’s about time. Keep checking back for updates. Curious – Do you sync your notes between devices with SpiderOak? If so, mind quickly sharing your solution and how it’s working for you? Thanks! Sorry for the delayed reply! Glad to hear about full text search, i’ll try it soonest. Re SpiderOak, i sync all my working files between my two (used to be three) working computers. In general it works perfectly, although sometimes i have to wait before shutting down to make sure all saved files have been uploaded properly. You can select which directories you want to sync. All my P.S. Notes files are in one directory on my desktop. I sync the whole desktop, so they are automatically included. One important tip: The SO client uploads automatically every time a file is saved. So with autosave applications like P.S. Notes or Gnote (Tomboy clone) which save every few seconds, SO would be uploading versions continuously. I manually set the backup/sync interval to 5 minutes to avoid this. I like SO because the service is an automatic cloud backup, and because it’s securely encrypted. May I request a feature? Some Markdown/plaintext software extensively make use of sub folders, such as Draft (https://play.google.com/store/apps/details?id=com.mvilla.draft). It would be nice if P.S. Notes. could read sub folders in the directory of choice and thus be more compatible with Draft. A folder tree similar to Zim’s http://zim-wiki.org/ could perhaps be used. I’d like to be able to improve PS Notes to work with sub-folders as well. For now, for any sub-folders you have, you can use the “remember notebook” feature to treat them as separate notebooks. I think that should be a helpful work around for now. That will work nicely! I should have noticed that one myself, so thanks for Ponting it out. Looking forward to whatever improvements you make to PS Notes. Just installed P.S. Notes today. Seemed like it was working, but then decided to delete an important note I made after I changed the first line (file name). How do I get a refund? Hi, I’m so sorry about that. It’s an issue that is fixed in the latest update in the PPA so you should install it from there. If you did get it from the software center, an update will come soon but it doesn’t allow me to give a refund. If you contact me via email at zach at stew.dk and maybe forward your purchase receipt I will try to help. I do feel horrible about that issue so I want to make up for it. Thanks. I have updated PS Notes again in the PPA and submitted to the Software Center (but that takes a month to update…) that is even more robust in ensuring notes are saved. Hi, thank you for this comment. Those improvements are definitely features I’d like to add in the future! Still missing saves. Seems extremely buggy to me. Provides ZERO notification of any kind of errors. Silent failures = bad coding. Sorry to hear that.. If you have any more info on what might have made it fail, you can let me know and I can try to help. But I’ve never had it fail on the latest version. I don’t know what’s causing the issue. However, I know restarting PSNotes fixes the problem. There needs to be a notification when PSNotes has trouble saving. Weird. Well, whenever I get to work on this again I’ll add that in first so it’s there. 2) Track whether the file ever got saved successfully, since the last modification. 3) When attempting to change to a different note or quitting the application, create a pop-up that informs the user if #1 is true and #2 is false. – when creating a note with an already existing name, I see that the last letter is substracted from the new file to avoid that it will be overwritten. I’d suggest to add a number instead (text1, text2, text3). If your note had only 1 letter, it then becomes 0 (tried it). If you won’t continue your project, at least I hope it will continue to work in the ubuntu environment for some time. Runs more stable than nvPY for me. Thanks for this comment – great, helpful feedback! I do hope to work on some of these improvements when I can. I’m definitely committed to at least keeping it alive for Ubuntu! Software Center updates seem to be abandoned by them, but I’ll keep it available through the PPA if they don’t publish it for future versions of Ubuntu. Would you consider WebDAV integration? The thing is, I’m quite weary of anything remotely “cloud”-related (and I really don’t care who is operating it, as long as it’s not ME), therefore I run my own WebDAV/CardDAV/CalDAV server; that solves address book and calendar integration and sync on Android, but regarding notes, I only got as far as storing them in text files and syncing them to the WebDAV server. I can access them on the phone with Lesser Pad quite nicely, but accessing them from my desktop in any sort of integrated fashion is unsolved yet – it looks like something PS Notes could definitely do (if it’s not too complicated, of course). What do you think? I just wanted to say that this works perfectly with OwnCloud, specifically the Notes app, in conjunction with the OwnCloud desktop client. I’m now able to view and edit my notes on the web, Android, and Linux desktop. Thanks! It’s dependent on GTK 3, sorry. When I use it, I’m on elementary OS, so that’s probably where it looks the best. Awesome, thanks 🙂 Not sure what’s next! Hi, just want to know what purpose is the markdown feature of PSNotes? How do people usually utilize being able to write markdown in note taking apps like PSNotes? Writing notes in markdown is useful and common, so it’s nice to have markdown syntax highlighting. Most people probably use simple markdown without even knowing it. I think what I meant by my question was how do you get a preview of the markdown you’ve written in PSNotes? My expectation was that you can see the output/formatting of the markdwon after writing it in markdown. Or maybe I just don’t get it that’s why I asked for what purpose it was. Ah, I see. A preview isn’t something that PS Notes can do. That’s a feature I would recommend using a dedicated markdown editor for. The best one for Linux seems to be one called Ghostwriter. a little bit late to the party, but I wanted to thank you for your work – I was looking so long for an app like psnotes, where I can store all my notes in plain text format. and dayjournal is also very fine. if they prove reliable, I would be happy to donate something. are you still working on these apps? I am not actively working on them (because they are pretty much complete). But I try to be very responsive and helpful if anyone has any issues. Also, I cannot publish them to the PPA anymore, so be sure you have the latest versions that are available to download from the page here for PS Notes or the DayFolder page for that. thanks for your reply and the information. so far, everything seems to work just fine, I’m gonna try the apps a little longer and eventually will give a donation. Wow man, I’m honored that you are here commenting on this 🙂 I’ll aim for this to be the first one I submit to AppCenter! Any change of getting a version for Raspberry Pi and other ARM-based computers? I’m not sure what’s needed to get that done, if anything. Could it be built from source as normal? I guess one can either compile it from source on a Raspberry Pi or do a Cross-Compiling on an x86 machine. I like DayJournal for Windows. Is there a Windows version of PS Notes?